Aimee graduated from Trinity College Dublin in 2002, she worked in Dublin and Drogheda before moving home in 2004. She worked in Dundalk for 10 years before setting up Friel and McGahon Dental in 2015. 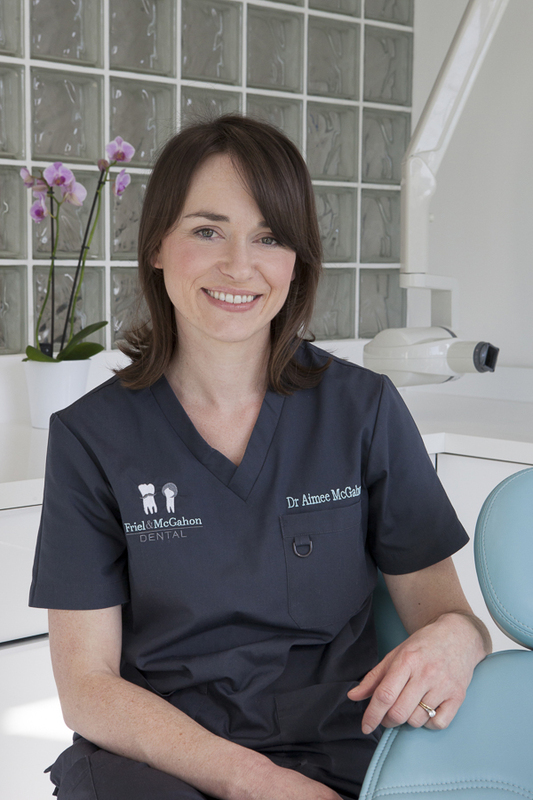 She is a member of the Irish Dental Association and is registered with the Irish Dental Council. Being a mother of five she has great understanding of how to deal with children and makes dentistry fun for them. She also treats a large number of anxious patients and has great empathy for them. She would love to rid the population of dental phobias. She concentrates on providing great basic dental care, leaving the crowns and molar root treatments to Fergus. She was nominated as a finalist Sensodyne Dentist of the year in 2016 and 2017. Aimee has a very relaxed approach to patient relationships and is known to stop the drill to hear what your opinion is on whatever radio show is playing. In her spare time she is very busy with her five children and sprimger spaniel, but she loves reading, listening to music (far too loud), swimming and having a good natter with her friends.